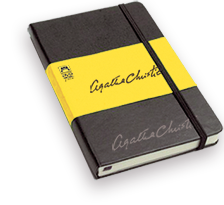 To celebrate the anniversary of the famous Belgian character, the Italian publishing house Malavasi gives away Agatha Christie‘s agenda, if you buy at least € 50 in DVDs from their collection of episodes 1989-2013 from the series Poirot with David Suchet or other crime TV series (Marple, Sherlock Holmes and Prime Suspect)! The DVDs are dubbed in Italian or you can watch them in original with or without subtitles. They have some extras, too: interviews to the cast&crew, photo galleries, actors’ C.V.s and so on. The agenda looks nice, as you can see below! I’m tempted to get one myself, as my DVD collection is not complete, yet! And I love this TV series! The blog is in Italian, so feel free to ask me a translation if you are interested. (For the record, I’m not in any way involved with Malavasi, I just like to post the news I got by newsletter 🙂 ).